I want to take this opportunity to thank and acknowledge “The Sisters”, Gloria Hadley and Kathy Gupton, in your California Realty sales office by Leisure World in Seal Beach. They provided excellent support and service during a very difficult time for my family. Their great attention to detail, and sound advice made a very mysterious process understandable. I never realized how daunting and filled with minutiae selling a house could be – they made it seem easy! They were always available to answer my questions to my satisfaction. My thanks again Gloria and Kathy for a job well done. 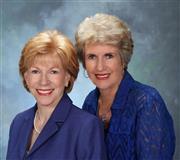 Kathy Gupton and Gloria Hadley were our realtors for the buying as well of the selling of my mother’s condo in LWSB. They are very knowledgeable, helpful, reliable, hard-working, caring, compassionate friendly, nice, they spent a lot of time with us, and went way beyond what was required to help us as much as possible. Because of their knowledge, quality and hard work, and the contacts they have, they found a buyer for and executed the sale of my mother’s condo in a much shorter period of time than other similar condos in LWSB during a very down market period of time for sellers of real estate in the United States. No other realtor could have probably sold my mother’s condo as quickly as Kathy and Gloria. Kathy and Gloria are sisters that are a good team that work very well together. They complement each other very well. You are truly getting two very good, conscientious, and hardworking realtors for the price of one. I have met many realtors in my time and Kathy and Gloria are overall the best realtors I have ever come in contact with. I give them my highest recommendations. Greetings Kathy and Gloria. Just a note to say Thank you for the disciplined diligence on the sale of my Mother’s place. You two gals are a remarkable team and I intend to make it known and recognized by all I have contact with. I assure you that praise will be sung, perhaps a little off key, but the lyrics will be on target. This gift is a little lady in the Swedish national dress and is coming to you to say “Thank You” for helping us sell our home. We appreciate your great patience in answering our many questions and explaining the terms on the many forms we needed to complete. We also appreciate the phone calls and express mailings that you had to make. In a previous year we called for an evaluation of our property, accidently got Kathy and was that our lucky day! Kathy and Gloria are both very professional, esp. good when answering questions in a low key non aggressive and non-pushy way. Follow thru was excellent and reassuring when usual anxieties occur. Promptness was greatly appreciated. I tell friends and acquaintances they are the best and most helpful in selling in today’s market. “The Sisters” are very detailed oriented, follow through, and keep client well informed. They are tireless showing property until client is satisfied. They will get my repeat business. We had chatted with Kathy and Gloria several times and were impressed with their desire to assist Helen and me when it came time to sell our home. They answered our questions, provided references and price comparisons when we required them. Their follow-up on the problems and other concerns we had was terrific and was timely. I cannot say enough good things everything was handled professionally and timely. They impressed us with sales ethics, professional ability and honesty. We would definitely recommend them to any party wishing to sell their property. A five star performance. “The Sisters” are very hard working, doing everything possible to have the sale come to a conclusion. We interviewed four agents from different companies. Gloria and Kathy appeared to be knowledgeable about our area and were not cherry-coating some of the difficulties of selling in this market. They made us feel they would do many different things to sell our home. We were always kept informed. A pleasant personality returned our calls promptly, calmed us when we panicked, and kept us realistic. They truly made us feel as though we were the only clients they had. I can’t think of anything better than that. They helped us through a difficult transition in our live. We’re truly grateful. Kathy and Gloria were very professional, courteous and patient in the role as a seller and buyer’s agent. They foster and encourage a work ethic in your office as demonstrated by The Sisters. What we appreciate was the continual update, follow-up, and sharing with us what’s happening. A credit to your organization. We were provided with excellent service and were kept informed at all times. The Sisters are very professional we appreciate all their hard work. We contacted The Sisters because of the many For Sale Signs in the neighborhood and the calendars they gave out. They were a Joy to work with and very knowledgeable about their work. We were kept constantly updated. They gave us suggestions for improvement and repairs. Everything went like clockwork. Kathy is a friend of many years. She originally sold us our property about 10 years ago. There were some problems with the property. Gloria and Kathy helped us with them and carefully selected a handyman. Without their help we probably would have never closed escrow. We can’t even begin to tell you how appreciative we are with regards to all of your efforts in handling the sale of Mother’s home. Your professionalism, your patience, your determination, your follow through is all characteristics we have come to appreciate. But most of all your sweet character is something very important to us as we have to come to know you even better the past few months. It is always a pleasure to refer my friends to you. I know they will be treated with courtesy and professionalism and you will be able to help them find the property that is right for them.